Alister Mcrath's series of guides to the basics of the faith builds with his Christian Belief for Everyone faith and Creeds His collection of 5 helpful and informative guides sets out the basic ideas of the Christian faith with insightful stories and enlightening illustrations. Compiled with the ordinary churchgoer in mind the guides will prove readable and engaging to interested readers outside the church who may have questions about the faith of Christians in relation to their own lives world issues and other faiths. The approach taken by accomplished author and communicator Alister McGrath is open to all denominations and a familiar parallel for readers of C S Lewis books such as 'Mere Christianity'. The series focuses on the life of faith as McGrath looks at why Christians believe what they do how these beliefs are best understood and how they impact on the way Christians think about themselves and their role in the world. The first volume in the expanding series Faith and the Creeds concentrates on the nature of faith and the history and relevance of the creeds In a reflection on what Christians really mean when they say I believe This is excellent preparation for exploring the leading themes of the Creeds in four subsequent volumes The Living God Lord and Saviour Jesus of Nazareth Spirit of the Living God and The Christian Life and Hope. 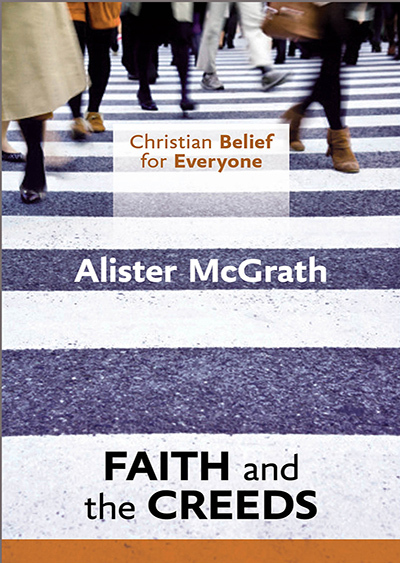 Christian Belief for Everyone Faith and Creeds by Alister McGrath was published by SPCK in February 2013 and is our 17011th best seller. The ISBN for Christian Belief for Everyone Faith and Creeds is 9780281068333. Be the first to review Christian Belief for Everyone Faith and Creeds! Got a question? No problem! Just click here to ask us about Christian Belief for Everyone Faith and Creeds. The Christian Belief for Everyone series comprises five guides to the basic ideas of the Christian faith. Full of stories and helpful illustrations, these guides have been written primarily for ordinary churchgoers, though they will no doubt also appeal to interested readers outside the church. The approach Alister McGrath adopts is non-denominational, very similar to the 'mere Christianity' advocated by C. S. Lewis. Indeed, the series may be seen as a guide to 'mere Christianity', focusing clearly as it does on the life of faith. We look at why Christians believe what they do; how we can best understand these ideas, and the difference they make to the way we think about ourselves and our world. The first volume, Faith and the Creeds, concentrates on the nature of faith and the history and relevance of the Creeds, in a thrilling reflection on what we really mean when we say 'I believe'. This is excellent preparation for exploring the leading themes of the Creeds in four subsequent volumes: The Living God, Lord and Saviour - Jesus of Nazareth, Spirit of the Living God and The Christian Life and Hope. Dr Alister McGrath is the author of a popular and academic books on belief, faith and theology and was included in "The 20 Most Brilliant Christian Professors" list. Dr. McGrath is also Senior Research Fellow at Harris Manchester College, Oxford, and President of the Oxford Centre for Christian Apologetics. Until 2008, he was Professor of Historical Theology at Oxford University. After initial academic work in the natural sciences, McGrath turned to the study of theology and intellectual history, while occasionally becoming engaged in broader cultural debates about the rationality and relevance of the Christian faith. He has a long-standing interest in educational issues, and has developed a series of theological textbooks which are widely used throughout the world.